Memphis filmmaker Morgan Jon Fox's third feature is a visual leap forward. Morgan Jon Fox is no stranger to the Indie Memphis Film Festival. Fox's debut, Blue Citrus Hearts, is a past winner of the festival's Hometowner Award. He tries to repeat that success this week with his third completed feature, OMG/HaHaHa, which debuted this summer at the Newfest festival in New York. 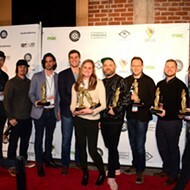 Fox's latest is a collaboration with John Tom Roemer, a young Memphis filmmaker who graduated from White Station High School and is now finishing film school in New York. Fox and Roemer co-wrote the film's script via e-mail, planned and cast the film when Roemer was home for Christmas break, and shot it the following summer. Where Blue Citrus Hearts was relatively conventional in following two teen protagonists through a coming-out drama and the uneven, overambitious follow-up Away (A)wake tried to blend its experimental tendencies around a narrative structure, OMG/HaHaHa dispenses with standard narrative. It's a series of often acutely observed moments from the often messy lives of a group of interlocking characters. The arc of the film is more emotional than narrative, though the film is given a web-culture framing device — one character "telling" these stories via his online diary — to pull its various strands together. The tender, compassionate tone is familiar from Fox's other work. OMG/HaHaHa, within the context of Fox's previous films, is probably most notable as a dramatic step forward visually, resulting in a film that works as well shot for shot as any local low-budget film in memory. "We spent a lot of time on art direction on this movie," Fox says. "We spent a lot of time thinking about how color and composition can really set a mood. We spent more time than I ever had before scouting locations and setting up shots." Though the film weaves through the lives of a couple of dozen characters, some strands stand out. Few local actors have been shot with as much love as that shown here to Suzi Crashcourse, Fox's longtime collaborator. "Suzi is transgender, and that's something I've had the honor of experiencing with her," Fox says. "I approached her and said I want to have a transgender character in this movie and I want you to let me know how this character should be portrayed. Because I'm not transgender, I don't understand that struggle. I haven't lived it. But her attitude was, 'No, just write it and I'll let you know if it's wrong.' We didn't want to make it that big an issue." For example, Crashcourse is shown reading to a group of kids at a bookstore. Afterward, one boy asks, matter-of-factly, whether she's a boy or a girl, an interaction that leads to some hide-and-seek amid the shelves. Later, Crashcourse's character is seen at home, taking a hormone shot while arguing with her mother on the phone. "She has to take a hormone shot once a month, and I had seen her do it. I thought it would be interesting in the scene to see her doing this without [explaining it]. Suzi said she thinks that's the first time there's been a transgender person taking a hormone shot on film." Visually, the most memorable moment might be the afternoon coupling of a couple of post-high-school guys who fell in love in geometry class and are taking their relationship into adulthood. "I've been criticized for 'playing the gay card,' but to me when I put these so-called issues in my films, they aren't issues. They're just what me and my friends are going through," Fox says. Following Indie Memphis, OMG/HaHaHa will screen at Chicago's Reeling festival in November and has been purchased by Water Bearer Films for a DVD release, probably next year. OMG/HaHaHa screens at noon Saturday, October 11th, and at 7 p.m. Tuesday, October 14th.